In this hilarious game, you read a topic card and then write down your response. It can be anything that comes to mind, there's no right or wrong answer! Then all the responses are read aloud and you have to figure out who said what! You won't believe the THINGS... the people you know will come up with! Laughter is what it's all about in The Game of Things. In each round, players write an answer to a topic such as "Things you would like to ask a psychic" or "Things you shouldn't do with glue." Answers can be as outrageous and hilarious or as straight-forward and precise as you like. Everybody then takes turns trying to eliminate each other by guessing which player wrote which answer. The last person left wins the round. 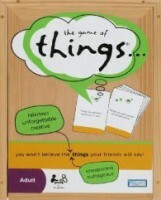 Add a Review for "The Game of Things"